Braverman Shaw-'Bravo' to his friends-always knew his father had secrets. But not until Dexter Shaw dies does Bravo discover that his father belonged to the Order of Gnostic Observatines, a hidden sect long believed to be extinct. For centuries, the Order has guarded a lost Testament that could shake Christianity to its foundations. Dexter Shaw was the latest Keeper of the Testament-and Bravo is his chosen successor. 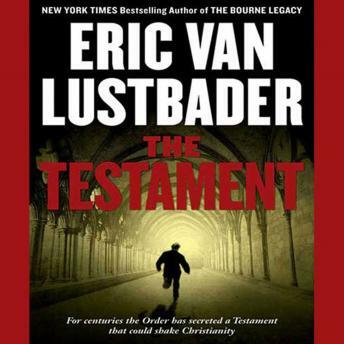 This was the second book that I have listened to by Eric Van Lustbader. The first being Robert Ludlum and EVL's The bourne Betrayal. Both books were exceptionally written and I can see why the publisher let him continue Jason Bourne's saga. This novel was very entertaining and for 7 hours it kept me listening intently.